Last week, from 25th to 29th September we successfully concluded DrupalCon Vienna, an international event which spread over the whole week including all side events like the Monday Business Summit and others. From a business perspective it offered various opportunities for collaboration, the business climate is positive and the major trend aligns with the goals of the Drupal Business Alliance, Drupal companies are joining forces! The week started with the DrupalCon Monday summits, an event hosted by the local Drupal community, Drupal Austria. One of the summits held was the Business Summit, which was hosted in cooperation with the Drupal Business Alliance network. Key results from the summit were the preparation of an RFP mostly contributed by Dominique De Cooman (Dropsolid), an active supporter of the Drupal Business Alliance, to ignite a crowd-sourced campaign to highlight Drupal as Business Solution. Another result was the initiation of a document series during the Drupal Marketing Sprint on Thursday which focused on forming a Drupal Buyer's Journey from an agency perspective, facilitated by Nathan Roach (Axelerant). Throughout DrupalCon Vienna, from the Business Summit to the Drupal Marketing BoF and on through the subsequent Drupal Marketing Sprint, there’s an emergence: increased collaboration is happening between digital agencies from across the Drupal marketplace to create shared, symbiotic value. During the Business Summit, Piyush Poddar and Nathan Roach helped kick off conversation around agency partnerships as a topic, as both presented on finding the right approach to success-driven partner vetting and selection. The presentation led to an open discussion on the transformation of outsourcing, and the primacy of agency partnerships which are happening in Drupal—both near and farshore. 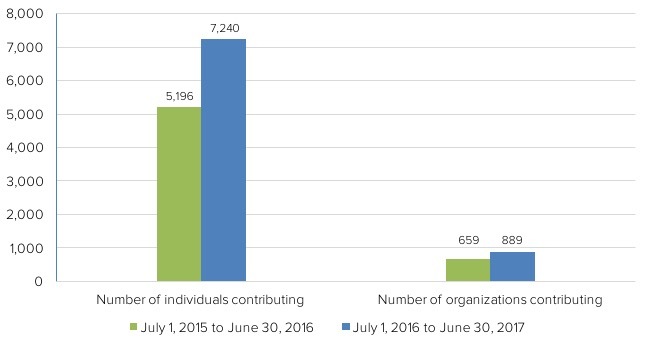 Compared to the previous year, we saw an increase in both the number of people contributing and the number of organizations contributing. Drupal.org received code contributions from 7,240 different individuals and 889 different organizations. The number of individual contributors is up 28% year over year and the number of organizations contributing is up 26% year over year. One of the key statements by Dries was "I believe that Drupal is no longer for simple sites. Instead, Drupal's sweetspot is sites or digital experiences that require a certain level of customization or flexibility — something I refer to as "richness". Later during the keynote Dries stated that Drupal and its contributors have made progress in both improving site builder tools and simplifying updates and maintenance. Watch the full recording (starting at 22:10), or download a copy of the slides (56 MB). On Wednesday Michel Van Velde (One Shoe) delivered a session about the activities that a salesperson has to engage in for the purpose of more capably influencing prospects. We visited also the session by Coding Girls, which we highly support to organize Coding Clubs for Girls to bring more diversity to business and our industry. We had a nice dinner in a very traditional Viennese restaurant with peers from a diverse group of CEOs from Drupal agencies across Europe, but also joined by others from the USA & India. This led to many interesting discussions, including the seeds of an idea which led to a collaboration between Christoph Breidert (1xInternet), Rouven Volk (Acquia) & the publicplan team that produced the Module Status module within the next 48 hours. The conversation wasn’t restricted to business though, there was much laughter as people got to know each other better over drinks which is always makes a more solid foundation to business collaboration. There were of course many other conversations, but the rules of the dinner state what’s being said at the dinner stays at the dinner. The survey amongst Drupal companies highlighted the need for Drupal companies to work together. Project pipelines and complexity is growing, which is a great opportunity for the industry. This took place for the first time last year, but this year there were a huge spike in the responses from 75 to 239. It was great to see a global response from over 40 countries. In over half of cases deal sizes grew. There was higher growth in industries served including arts and culture, automotive, charities and non-profits, construction, consumer electronics, entertainment, government and many others. The largest growth could be seen in consultancy & healthcare. Apart from the obvious web development service provided, the next few were visual design, user experience, training, system integration & support. The biggest growth was in user experience, support & mobile development. It was also interesting to see that 35% of agencies had expanded beyond just delivering Drupal websites. There were some challenges raised about recruiting and retaining talent, but the report summarises a need for collaboration and actively accelerating our growth. Find out more about the survey results. The marketing sprint started with sourcing ideas for immediate execution. As most of the attendees participated during the Monday Business Summit. Chandeep Khosa (Drupal Consultant) wrapped up the event in a blog post. One of the key results was the initial mapping of the Drupal Buyer’s Journey, led by Nathan Roach and another “Showcasing examples of Drupal websites in the publishing industry” led by Lara Knebel (publicplan GmbH) and Dominik Kipar (Hubert Burda Media). In the recent years, Drupal went through transformations which made the platform a good fit for enterprises. Price sensitive sectors like Government and NGO were the first ones to pick up. While a handful of companies managed to market their Drupal-powered brands as global leaders, there is not enough investment and coordination in marketing Drupal as a whole to compete against billion dollar companies, therefore several companies working with small to large enterprises decided to join forces and form a global alliance. The session “Drupal Enterprise Marketing as a Global Business Alliance“, delivered by Ivo Radulovski outlined the direction and the next steps in marketing Drupal as an Enterprise solution by the Global Drupal Business Alliance and how Drupal companies can contribute to a successful future of Drupal in the enterprise sector. Currently more than 40 companies signed up to join the alliance across the globe. While developers had the chance to participate in the code-sprints a few agency owners and executives came together to discuss strategies for 2018, how to expand the business eco-system, implement ideation governance between companies and unite resources to achieve projects with business impact on a global scale. Overall all indicators show strong growth in the Drupal space, contribution and business wise. We are looking forward to the next edition in early 2018! Meanwhile sign up or follow us on Twitter to stay up to date.